The short sleek human hair wig features stunning straight with long side sweeping fringe that frame your face beautifully. Soft layers on the end to give you a natural look and ultra-comfortable fit. 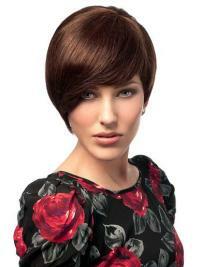 Open top construction with the fine wefts and nets, making this 100% remy human hair wig lightweight, airy and easy to wear. I absolutely love this wigI absolutely love this wig! I ordered and it's amazing. the colour, the layer the length, I have never really been disappointed with HoWigs wig! Very cute wigVery cute cut wig. Love the human hair with the flexibility to curl it. Very flattering and I'm considering getting another one! Nice styleThis wig is GORGEOUS! The style is very nice too, although, I found that there was a little less volume than the picture, the fringes were just the same. the style is quite pretty and when i wear it was amazing! You are my store!First day that I recieved it. I wore it out and everyone wanted to know, who cut my hair. I love it and I got another one. You are my store! The size is perfect. My rating is pass five!